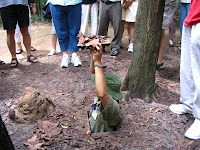 Ho Chi Minh - We toured around the city and also visited the nearby Cu Chi Tunnels. At the tunnels you watch a video explaining the history of the area, then you have the opportunity to descend into a small section of tunnels that have been enlarged to allow tourists. Even so, it is an eye opening experience as to how tiny the tunnels were, not for the claustrophobic! The area also has examples of booby traps and you have the chance to fire an AK47 or M16 rifle. Danang/Hoi An - After a short flight we arrived into a very stormy Danang, located near the middle of Vietnam. 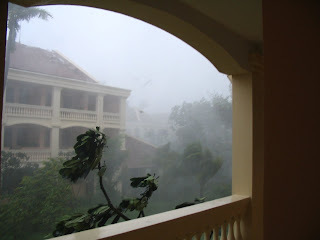 We saw the Cham Museum before heading off to Hoi An, where we learned that Typhoon Xangsane was headed straight for us! The rest of this day was spent exploring Hoi An on foot, we saw temples, silk factories and the 14th century Covered Bridge. Luckily the hotel we were at had internet, so we were able to contact our families and let them know about the impending typhoon. Needless to say this didn't bring a lot of comfort to my husband. Overnight the storm was supposed to hit, my roommate and I set an alarm so that we could get up at 2am and see if it had. The major winds didn't end up hitting until about 10am, then lasted for a few hours until the eye of the storm came over us. The storm lost all momentum once it hit land, so we never saw the back half of the storm. 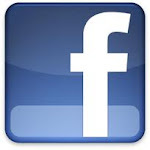 In all, it was classed as a category 4 typhoon, and hundreds lost their lives in the Philippines, Vietnam and Thailand. The damage was visible to us the next day as we made our way north to Hue. What I found most amazing about the whole experience was seeing how the Vietnamese people just picked themselves up and went about their normal life as best they could. Neighbours worked together to put houses back together, mattresses, clothing and rice were all laid out to dry, and the markets were back to being busy. Because of all the delays, we were late getting to Hue and missed out on seeing this historical town. 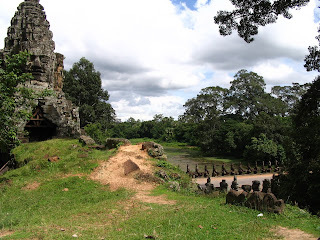 Such a shame as we would have gotten to see the Perfume River, Royal Tombs and the Thien Mu Pagoda. 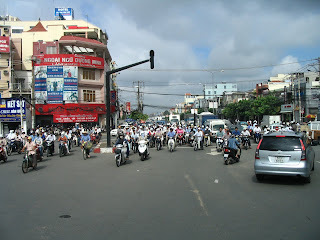 Hanoi - Another short flight took us to Vietnam's capital located in the north, Hanoi. This city has such charm! There's a beautiful lake, many gardens and temples and fabulous shops in the old quarter. We toured through the Temple of Literature, the Museum of Ethnology and then we each had our own rickshaw take us through town to end up at the Thang Long Water Puppet Theatre. The Water Puppet show is outstanding, filled with traditions and accompanied by live music. Early on our last morning in Hanoi, I decided to wander a short distance from our hotel on my own. 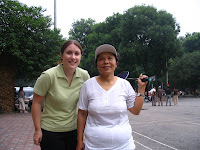 I got to see a little slice of how the Vietnamese spend their free time; going to markets, doing Tai Chi in the park, exercising and even playing badminton on the side of the street. I watched the game for a few minutes before they invited me to play. This was so much fun, even though we didn't speak the same languages! Then, we had a bit of free time so my roommate and I took a taxi into the old quarter to take advantage of the many inexpensive shopping options. There is literally a street dedicated to each type of merchandise, imagine "Purse street", "Jewellery street", "Food street". My advice is to pack light so that you have enough room for all your purchases! Siem Reap, Cambodia - Another short flight and we arrived into Cambodia. This is a country that has only been safely open to tourists since the early 1990's when a peace settlement ended years of Khmer Rouge rule. 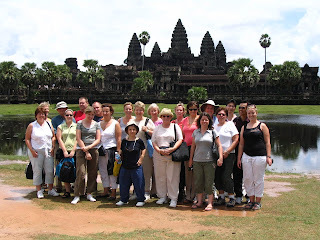 The main draw is the ancient city of Angkor and it's most famous temple, Angkor Wat. The sheer scale of Angkor and it's temples is shocking, researchers found that at one point the city stretched over 3000 square kilometers. Angkor flourished between the 9th and 13th centuries, then the ruins lay hidden in the jungle until it was discovered again in the 19th century. We saw the most popular temples; Angkor Wat, Angkor Thom and Ta Prohm (which is where Angelina Jolie filmed the Lara Croft movie). Some temples have been restored, and others have been left to fall apart as the jungle grows through the structures. What an amazing place! Did I mention that the number of scooters on the roads is outrageous? It wasn't uncommon to see a family of 5 all piled on board. In closing, I absolutely loved this trip. The sounds, smells, sights, food, and people are all unique and made this trip what it was. 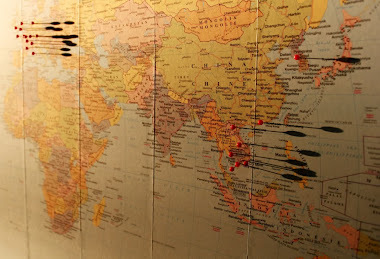 I loved Vietnam so much, that I'm taking my husband there this coming April 2010. I can't wait to be back!